Overflowing landfills, plastic waste in our oceans – the issue of plastic pollution is no longer merely a concern of environmental activists. It has become a matter of public interest and government legislation, and has also prompted big retailers to embrace waste reduction and recycling programs. The trend towards sustainable packaging has been growing significantly in the past years, bringing into focus reusability, bio-degradability and recyclability of the packaging materials. PET is a plastic that can be recycled and upcycled economically. In many countries exist functioning collection and recycling schemes for PET which provide a source for recycling material. In the area of consumer products, where many stakeholders are already putting a focus on sustainability, fabric produced from rPET flakes can be used for various types of sacks. They provide an attractive packaging for dry bulk goods such as fertilizer, building materials, pet products such as kitty litter or pet food, as well as grains and flour. PET tape fabric stands out for its excellent aroma and grease barrier as well as its food safety; rPET fabric produced using Starlinger decontamination technology meets US FDA (Food and Drug Administration) requirements for use in food packaging. For packaging users who want to switch to woven rPET sacks for filling their product, only low investment is required. For consumer applications, attractive package design is possible by laminating the rPET fabric with reverse printed BOPET film, which gives the sacks a stunning shelf appearance. A perfect example of eye-catching design on a sustainably produced bag are rPET PP* STAR bags – pinch bottom type bags which are produced on machinery developed by Starlinger (PP*STAR® is a registered trademark and produced exclusively on Starlinger machines). 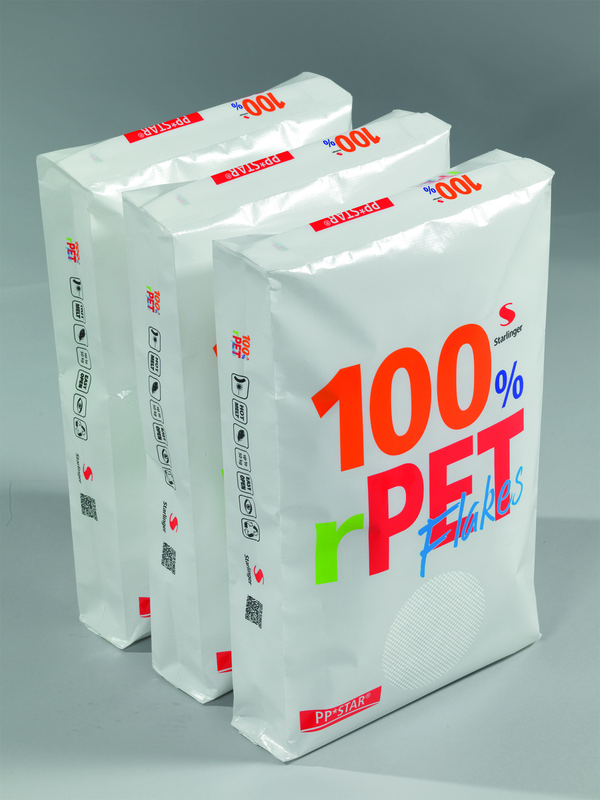 Made of polypropylene, they are already a popular packaging for sensitive products such as dry pet food. Now, they can be produced directly from PET bottle flakes. rPET PP*STAR bags are a very sustainable packaging option that gives the product both a high-class look and best possible protection: they are fully recyclable and Press Release Page 2/2 can be used to produce PP*STAR pinch bags again – or any other woven plastic bag type, for that matter – thereby closing the loop in the packaging cycle.